Still threading along Jalan Yahya and with a piece of 面煎粿 in hand, munching away as I took my steps forward, a small little signage beckoned for my attention. “Laksa 叻沙”. These words are just all too recognisable for anybody, coming across it in hawker centres, foodcourts, on the menu of cafes, and even throughout the duration of this road trip. Tradition aside, it has proven how a simple, inexpensive bowl of noodles managed to capture our hearts, keeping a firm foothold in Malaysia's food culture. 不让他人专美，食材简单纯普的叻沙也在马国饮食文化中，占有一席之位，与许许多多富丽堂皇的佳肴美食肩并肩. This Teochew-styled laksa has some generous amount of ingredients in it, cockles, shrimps, fish cakes, bean sprouts and a surprise amongst the package, omelette strips. 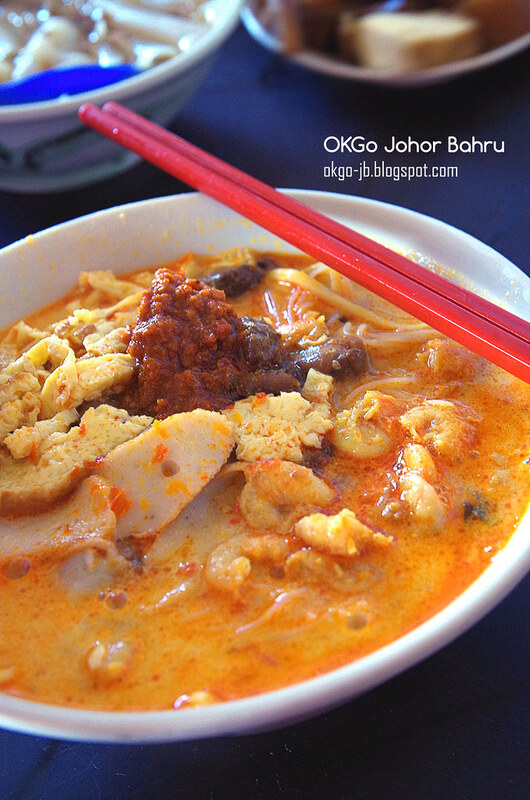 I haven't really seen this combination outside of Muar before, and words from the locals have it that in the last century, omelette strips were a substitute for shrimps in laksa, whenver it ran out. A glimpse of it tells me this bowl of laksa packs a fiery punch, but yet without hesitating, I went against my better judgement and twirl the sambal with the curry in a singular motion. As a result ? The expression on my face, condensation of droplets ... after droplets ... I can never comprehend why one can live with such torture and never had enough of it. That's because at the end of everything, there's only one word that best describes it "Shiok" ! Regular@RM3 and Large@RM4. Pictures courtesy from OKGo JB. The laksa stall is located in this coffee shop by the corner, 华南茶室. A cup of traditional coffee and toast would have perked me up and kickstart my day too, but I chose an alternative with more ommphh. Conclusion: After thoughts of the laksa ? Noodles were done al dente, the curry, that richness of coconut milk in it and plus, I've gotten more than what I had bargained for with that sambal. How can it not be a memorable experience ? Recommended. I agree with you, the laksa is great.